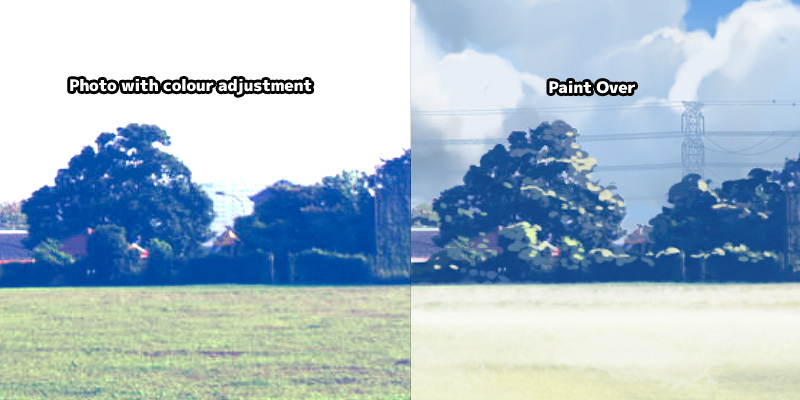 This is a tutorial on painting over a photo to turn it into a makoto shinkai style anime background. The photo will be colour adjust to a palette similar to his film first. Then most of the painting will be done using default Photoshop round brush and chalk brush with some settings adjustment. The photo we going to use doesn't need to be in HDR or super high resolution because we are only using it as a base for our painting. Below is a location photo I took with my camera phone few years ago. Important! Use only public domain images or Creative Commons image with derivative rights. Before painting, we will apply colour adjustment to the photo to increase more blue and cyan hue to the shadow. 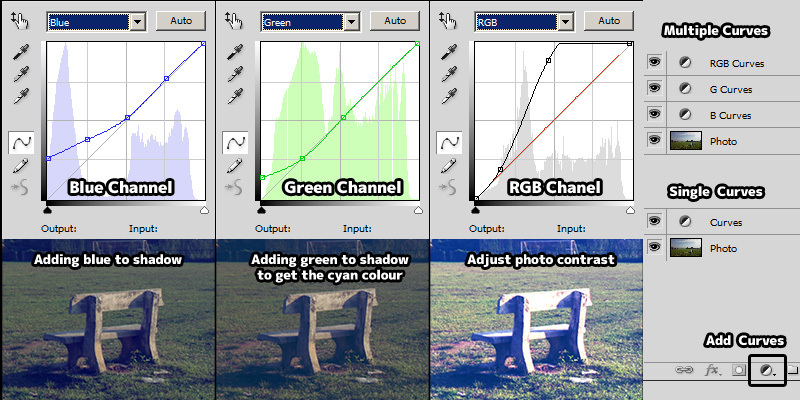 This step is important as it remove the "realistic" colour palette from the photo. Add a "Curves adjustment" under the layer tab. CTRL-M can be use too. Go to Blue channel and move the lower left point upward (shadow). Add a few more points in middle (Midtone) and top right (Highlight), so our adjustment doesn't affect those area which is the midtone and highlight are of photo. Go to Green channel and move the lower left point upward slightly. We are adding a bit of green tint to the shadow, so the final colour will be closer to cyan hue. Go to RGB channel and add contrast to the image by darkening the shadow and boosting the highlight. This is what people usually call the "S Curves", but I might have over done in my case here, which is needed for the painting later. You can use multiple curves or a single curve. It doesn't affect the end result. 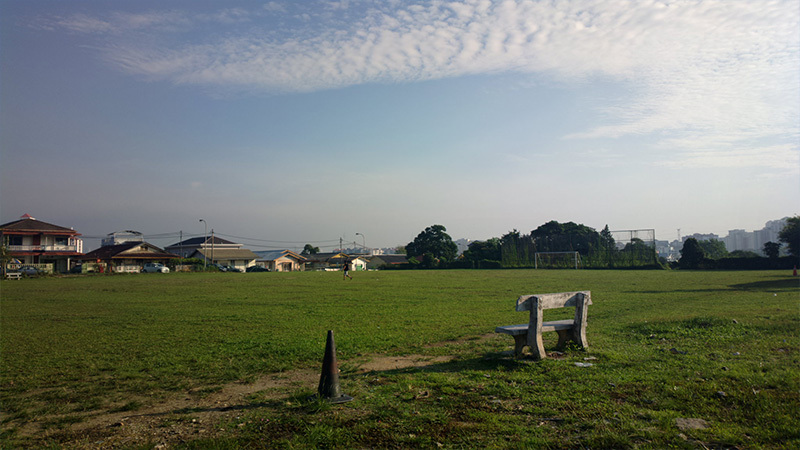 A comparison images of before and after colour adjustment. If the final result are over saturated, use "Hue/Saturation" (CTRL-U) filter to desaturate it slightly. Seperating the background elements into different layers will make the painting process easier. 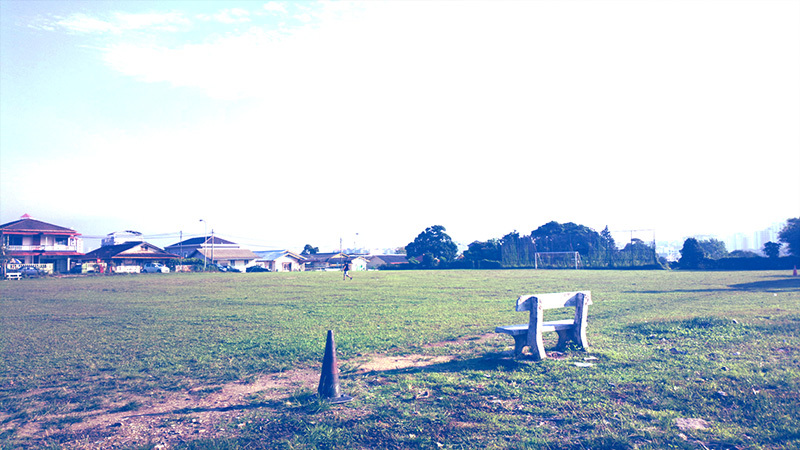 For example, I seperate the bench and cone into different layers, so it will be easier for me to paint the grass. This step can be done right after colour adjustment or anytime during your painting process. Tip! More layers does not mean better. Plan and name your layers properly when working in group project. Use the eyedropper tool to colour pick and paint over unnnecessary details or elements. Any brush can be use for the paint over process. I am mostly using these default Photoshop chalk and charcoal brush. 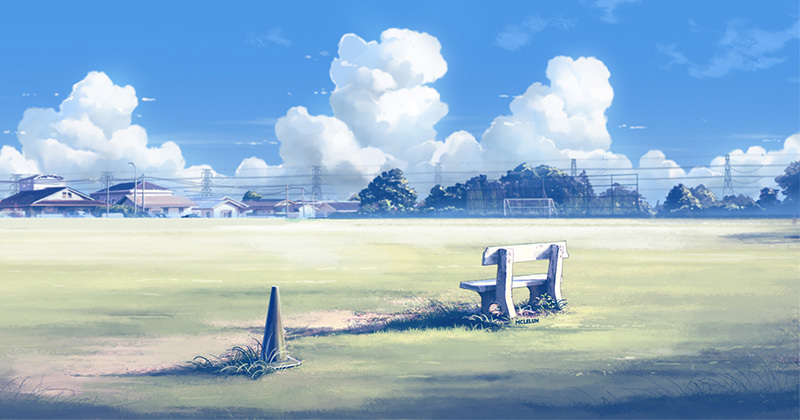 The grass seem to be over detail and realistic for an anime background art so just paint over them especially those in distance. 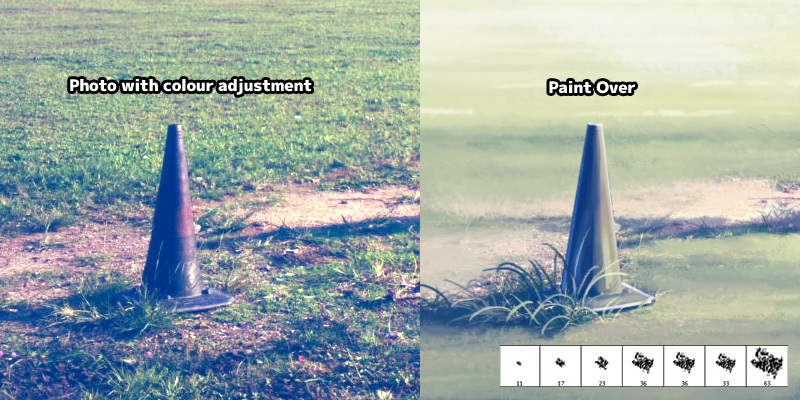 Redraw those grasses nearer to the view using the shape brush too. Paint over the distance trees with brighther shade of colour in hilight area. Another vital step to make a photo to look more like an anime background is replacing the sky and cloud with our own painting. Draw the cloud shape with any brush of your preference. Lock layer transparency and start shading the cloud. More tutorial! 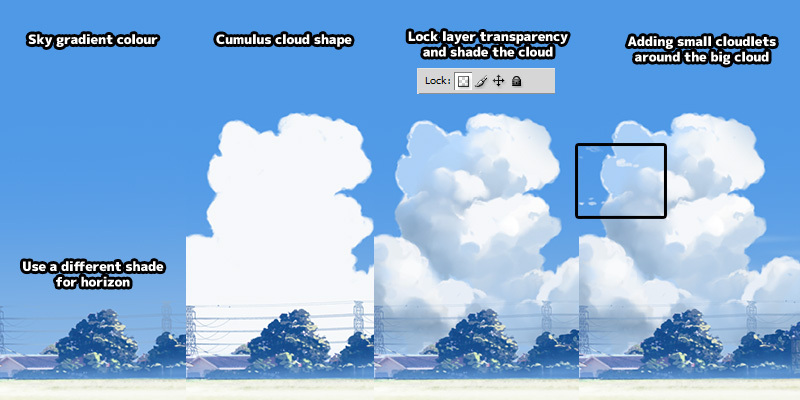 I have another tutorial which cover more info on anime cloud painting. 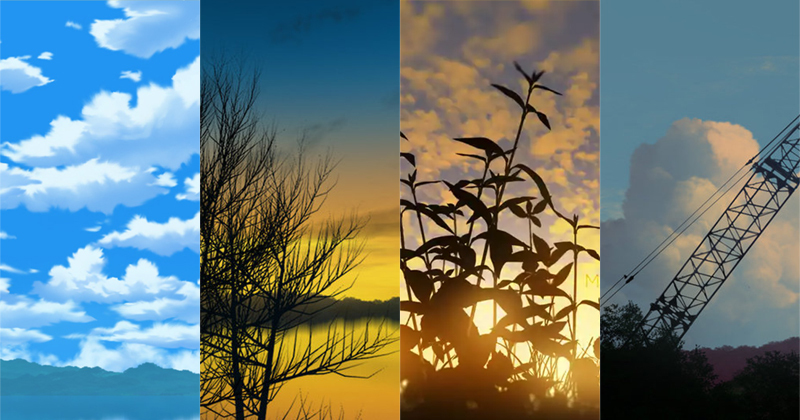 The final step would be adding atmospheric effect. Do not over do this step, as your artwork might look wash out. Add a new layer. I am using "normal" blending mode, but you can try other mode such as "screen". Paint near the horizon where haze or fog are observe. 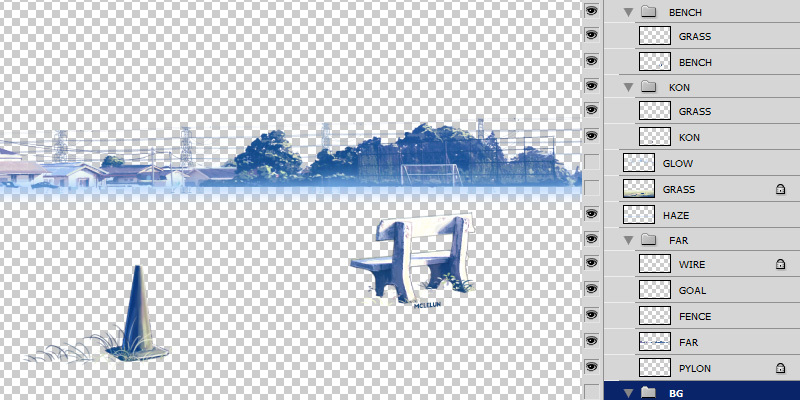 Adjust layer opacity if needed. Before and after paint over comparison images. This is another version I did in 2014 using the same photo but with a more realistic color palette. A timelapse video showing the process of painting over photo into anime style background art. 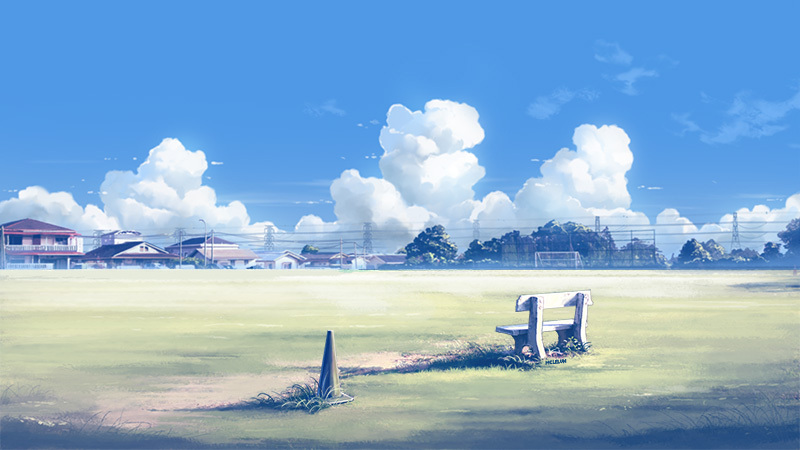 If you enjoy this Makoto Shinkai style anime background tutorial, you might be interest with the following too. I got lost when you put in all those folders. 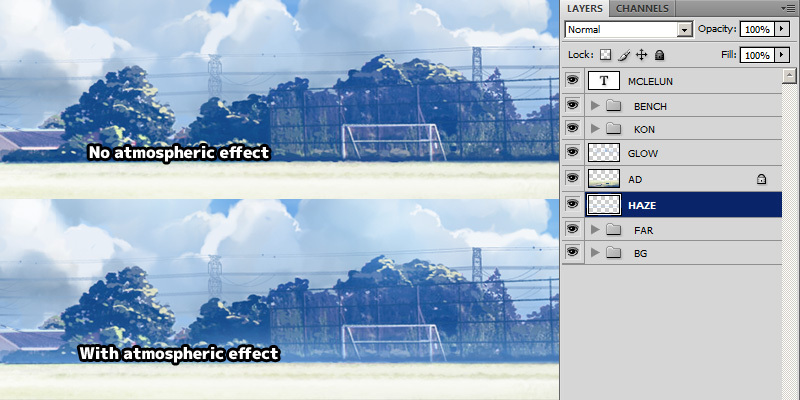 I think it'll help me more if you explain how you put all those layers there and also add the settings to them all. When I tried doing the curves, I had to guess the settings. Maybe if you explain better on how you got all those layers in the second part of the tutorial, it could help me more. Yo yo yo, this really helped me a lot thanks!! !